Barbed wire is a fencing material consisting of a metal cable with regularly spaced sharp projections. The cable usually consists of two wires twisted around each other to add strength and to allow the cable to expand and contract with temperature changes without breaking. The sharp points, called barbs, usually consist of short pieces of wire twisted around one or both of the cable wires. Fences of various kinds have been used since the earliest days of agriculture 10,000 years ago. Fences have been built from wood, earth, stone, and living plants (hedges in Europe and cactus in Latin America). Metal was not used for fencing until steel wire became available in the 19th century. Short lengths of wire were first made at least 5,000 years ago by hammering pliable metals such as gold. By the year 1000, longer lengths of wire were made by pulling rods of soft metal, such as alloys of lead and tin, through a die of harder metal, such as iron. In modern times, until the middle of the 19th century, most wire was made from wrought iron. By 1870 improvements in steelmaking made it possible to produce large amounts of steel wire for the first time. Steel wire was first used for fencing during the settling of the American West in areas where wood was scarce. 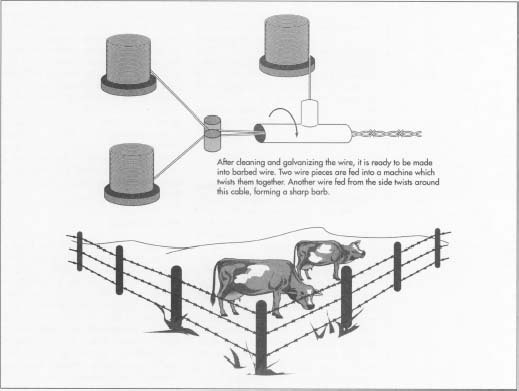 Early wire fences consisted of single strands which were easily broken in cold weather or by wandering cattle. In 1860, Frenchman Leonce Eugene Grassin-Baledans patented the use of twisted strands of sheet metal with projecting points as a "fence protector." A similar method was patented in the United States in 1867 by Alphonso Dabb. That same year Lucien Smith and William Hunt received patents for single-stranded wire with barbs. In 1868 Michael Kelly invented the first double-stranded barbed wire, but the first commercially successful barbed wire was patented by Joseph Farwell Glidden of DeKalb, Illinois, in 1874. Similar patents were filed that same year by Jacob Haish and Leonard Ellwood, both also of DeKalb. After twenty years of legal battles, the United States Supreme Court decided in Glidden's favor, and he is often thought of as the "inventor" of barbed wire. The use of barbed wire increased tremendously in the 1870s and 1880s, with some unfortunate side effects. In the severe winters of 1885-1886 and 1886-1887 thousands of cattle froze to death when they were unable to break through barbed wire "drift fences" intended to keep them from straying too far south. Conflicts between ranchers who wanted unfenced pastures and farmers who wanted fenced croplands escalated into fence-cutting, land-grabbing, and violent range wars. Eventually the conflict subsided when it became clear that barbed wire was becoming necessary as humans and cattle increased in number. Barbed wire was adapted for military use during the Boer War and used in enormous quantities during World War I. Although barbed wire is often used for security, agriculture still accounts for 90% of its use. Many people collect antique barbed wire, with some rare specimens selling for hundreds of dollars. Hundreds of collectors attend the annual Barbed Wire Festival in La Crosse, Kansas, home of the Barbed Wire Museum. Barbed wire is usually made of steel, which is an alloy of iron and a small amount of carbon. The raw materials required to manufacture steel are iron ore, coke (a carbon-rich substance produced by heating coal to a high temperature in the absence of air), and limestone. To prevent rusting, the steel wire is usually coated with zinc. Sometimes the steel is coated with aluminum, and occasionally the barbed wire itself is made of aluminum. 1 Iron ore, coke, and limestone are heated in a blast furnace by hot pressurized air. The coke produces heat (to melt the iron ore) and carbon monoxide (which reacts with iron oxides in the ore to release iron). The limestone reacts with impurities in the iron ore such as sulfur to form slag, which is removed. The final product of the blast furnace is pig iron, which contains at least 90% iron, 3-5% carbon, and various impurities. 2 To convert pig iron into steel, the impurities and most of the carbon must be removed. (Iron without carbon is much weaker than steel, but iron with too much carbon is brittle.) Various methods exist to purify pig iron, the most common of which is the basic oxygen steel (BOS) process. In this method oxygen is blasted into molten pig iron under high pressure. Carbon is released as carbon monoxide, and the impurities are released as slag. The remaining molten steel is poured into molds and allowed to cool into ingots weighing thousands of pounds each. Aseemingly simple invention, the barbed wire has had an interesting history. Before its introduction, early American farmers relied on European traditions to create an adequate enclosure for different types of farming. They had tried common fields without enclosures, "d&ad" fences of stone or timber, "live" fences of hedge plants, or simple wire fences. Eventually they were replaced by barbed wire, which was affordable, relatively simple to install and maintain, did not monopolize scarce local resources like timber, and proved highly effective in controlling livestock. Barbed wire was an immediate cause and central weapon in the infamous "rouge wars" between cattlemen and farmers. 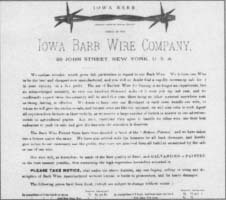 Barbed wire was also the center of controversy as various inventors and manufacturers battled over patent rights and licenses and ultimately formed the Barbed Wire Manufacturers Union to establish prices. Farmers charged manufacturers with price fixing and monopolistic practices, and they banded together against the manufacturers. Barbed wire factories also brought industry to rural America. DeKalb, illinois, was a sleepy farm hamlet sixty miles west of Chicago until local inventor-entrepreneurs like Joseph Glidden and Jacob Haish became heavily involved in barbed wire production in the 1870s, Factories with new kinds of industrial jobs changed the town's economic base and demographics, whiie expanded railroad facilities brought it that much closer to Chicago. The addition of a normal school and teacher's college in the 1890s confirmed the transformation and DeKalb, also known as "Barb City," began the 20th century a virtual outpost of the great metropolis. To make barbed wire, iron ore, coke, and limestone are heated in a blast furnace to produce pig iron. The pig iron is purified and converted to steel. larger, the bar is known as a bloom; if the cross-section is rectangular rather than square, the bar is known as a slab.) A steel ingot is heated until it is about 2192°F (1200°C), then rolled back and forth between grooved rolls until it has reached the proper size. Giant shears cut the billet to the desired length; then it is allowed to cool. It is also possible to form billets directly from molten steel by pouring it through a water-cooled copper mold to shape it, then spraying it with water to solidify it. 4 The steel billet is again heated and rolled until it has been shaped into a round bar 0.2 inch (5.6 mm) in diameter, known as a wire rod. 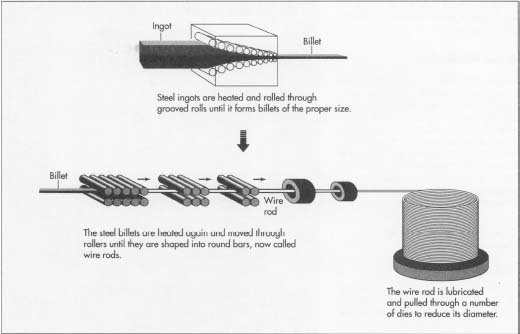 The wire rod is rolled into a coil weighing as much as 3,969 pounds (1,800 kg), which is shipped to the wire manufacturer. 5 Scale, a surface coating of iron oxide which forms on steel when it is heated, must be removed from the wire rod. This can be done by soaking it in hot, dilute acid (sulfuric acid at 180°F [82°C] or hydrochloric acid at 140°F [60°C]) and rinsing it with water, a process known as pickling. Scale can also be removed by bending the wire rod back and forth between a series of wheels to break it off, or by blasting it off with fast-moving particles of sand, aluminum oxide, or cast-iron shot. 6 The clean wire rod is coated with lime, borax, or phosphate. This coating prevents rusting, neutralizes any remaining traces of acid, and helps lubricants adhere to the wire rod when it is made into wire. original size to the desired size of the wire. For barbed wire, the diameter is typically 0.097 inch (2.5 mm). Usually about six or seven dies are needed to reach this size. 8 Drawing the wire causes it to become hard and stiff. To make it pliable, it is heated, a process known as annealing. Wire can be annealed by heating it in a bath of molten salt, a bath of molten lead, or in a furnace containing nitrogen. All these methods prevent scale from forming by protecting the steel from oxygen. 9 Wire to be made into barbed wire is usually galvanized (coated with zinc) to protect it from corrosion. The wire must be perfectly clean and dry to be properly galvanized. First it is cleaned in a bath of hot, dilute hydrochloric acid, then rinsed with hot water. It then passes through a solution of hot zinc chloride or ammonium chloride to prevent rust from forming as it is dried. After drying, the wire passes through a bath of molten zinc. Excess zinc is wiped off and the coated wire is allowed to cool. (Some-times the wire is coated with aluminum instead in a similar way.) Wire can also be coated with zinc by a process known as electrogalvanizing. The wire is given a negative electric charge and passed through a solution of zinc sulfate or some other zinc salt. The positive zinc ions are attracted to the negative wire and form a coating. 10 A single automated machine performs all the steps needed to transform galvanized wire into barbed wire. Two wires are fed into the machine and twisted together to form the cable. Another wire is fed into the machine from the side and twisted around one or both of the cable wires. This wire is cut at an angle on both sides to form a two-point barb. Two wires are twisted and cut together if four-point barbs are needed. The barbed wire is pulled along a set distance (usually 4 or 5 inches [10 or 13 cm]), and the process is repeated to space the barbs evenly. The barbed wire is wound onto spools and cut into 1,319-foot (402 m) lengths. These spools are then loaded onto trucks and shipped to the customer. Standards for barbed wire have been established by the American Society for Testing and Materials. Manufacturers of barbed wire use the tests described in these standards to ensure their customers that they are purchasing a quality product. One spool of barbed wire out of every 50 is selected for testing and inspection. First the dimensions are measured for accuracy. The diameter of the cable wires and the barbs must not vary more than 0.5 inch (0.13 mm). The barbs must extend at least 0.37 inch (9.5 mm) from the center of the cable. At least 93.5% of the spaces between the barbs must be within 0.74 inch (19 mm) of the desired length. (100% accuracy in barb spacing is impossible due to small movements of the barbs during handling.) A 25-foot (7.6 m) sample of the barbed wire must contain at least 69 barbs if they are spaced 4 inches (10 cm) apart and at least 55 barbs if they are spaced 5 inches (13 cm) apart. The wire on the spool must be at least 1,319 feet (402 m) long. A strength test is performed on a 4-foot (1.2 m) sample of the barbed wire. The sample is pulled by a measured force until it breaks. It must be able to withstand a force of at least 4,230 newtons. For galvanized barbed wire, another 4-foot (1.2 m) sample is tested for its zinc coating. The sample is weighed, then the zinc is removed with hydrochloric acid. By weighing the sample again and noting the difference in the two weights, the amount of zinc coating can be determined. A similar procedure is used to measure the zinc coating on the barbs. The minimum weight required varies with the diameter of the cable wires. For the most common diameter (0.097 inch or 2.5 mm), each line wire and each barb must be coated with at least 3.2 ounces (90 g) of zinc per square meter (11 sq ft) for a Class 1 coating or at least 8.6 ounces (245 g) per square meter (11 sq ft) for a Class 3 coating. Standard Grade barbed wire has a Class 1 or a Class 3 coating on the line wires and a Class 1 coating on the barbs. Chain Link Fence Grade barbed wire must have a Class 3 coating on the line wires and the barbs. Although the classic barbed wire fence is still commonly used on farms, it is slowly being replaced by more advanced products such as woven wire fences (similar to chicken wire, with crossing horizontal and vertical wires) and electric fences. For military and security use, barbed wire may become obsolete with the recent development of barbed tape, a flat, thin strip of metal which has been cut to produce clusters of sharp points. Perhaps some day barbed wire will exist only in museums and private collections. Hooper, Meredith. Everyday Inventions. Taplinger, 1976. McGannon, Harold, ed. The Making, Shaping, and Treating of Steel. Herbick and Held, 1971. Evans, Charlotte. "Time Was When the Wild West Danced to the 'Devil's Rope'." Smithsonian, July 1991, pp. 72-83.